Bedré Fine Chocolate remained a local staple, and in 2000, the Chickasaw Nation purchased the company and gave it new life. Building on a rich legacy and love of curating the bold and delicate flavors of chocolate, the Chickasaw Nation turned the small chocolatier into a nationally recognized luxury chocolate brand. Having upgraded our manufacturing facilities with state-of-the-art technology and practices, Bedré Fine Chocolate has set the standard for premium quality chocolate. Our recipes are tried and true and reflect the time-honored tradition of the Native American peoples who first cultivated this divine delicacy. Now, as the only Native American tribe to create its own brand of fine chocolate, we take great pride in our products and instill our cultural passion into every delicious morsel. Given our strong ties to our culture and community, we make an effort to give back to the land and people who support us. 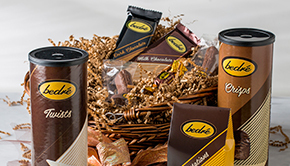 Bedré Fine Chocolate enjoys contributing to educational, health and wellness programs and also supports the endeavors of a number of philanthropic organizations within the Chickasaw Nation.